This quiet community has about 3500 people. We are located just south of Lancaster, PA (40.5N, 76.15W). Conestoga was first called Conestoga Manor by William Penn. This name came from the Conestoga Indians that inhabited this land. The town of Conestoga Centre was laid out by John Kendig, Harry Breneman, Edward Charles, and John Folkman in 1797. Conestoga is located near the confluence of the Susquehanna River and the Conestoga River. The Conestoga River is usually a shallow meandering river. We often wade in it during the summer when the water is low. After a heavy rain, the river's water turns a muddy brown from the runoff of the fields and roads. 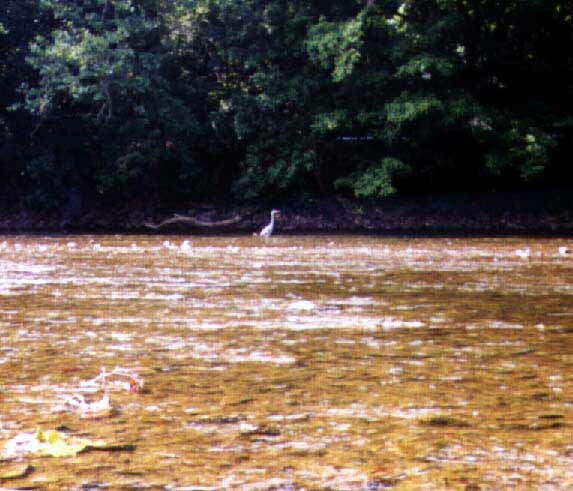 Here is a photo of a Great Blue Heron fishing in the river in August. 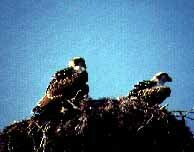 The same day, we saw this osprey family which had nested in a tree hanging over the river in the Safe Harbor Park. We watched the parents dive into the water fishing for food for their youngsters. It was quite a thrill. This small town has a claim to fame. Can you guess what it is? I'll give you a hint: Wagons Ho! This was the building place of the Conestoga wagons. These wagons hauled freight in the 1700 and 1800's. Did you know that the bottom of the wagon was bowed so the barrels wouldn't roll out on the hills? There is a wonderful historical museum in the Allen Erlich Community park. The museum is run by the local historical society. They have a real Conestoga wagon, as well as, many interesting local artifacts. The park also provides a public swimming pool, picnic pavilion, and a baseball diamond for community member's use. The Conestoga community is largely farms and small businesses. You will see many dairy farms with black and white Holstein cows. Amish people live in our community, too. The Amish people reject modern ways. They avoid using electricity. So they have no TV, video games, & no computers. They avoid using clothes adornments like buttons or snaps. The women use straight pins to hold up the bib of their aprons. They are largely farmers, though some are craftsman. The women make beautiful, colorful quilts which can often be enjoyed hanging on the clothes line. No clothes dryers! Most remarkable is that they have NO cars or trucks. 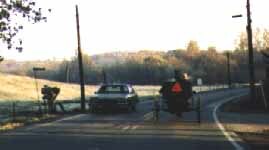 We must be very careful driving on our narrow country roads because you can often encounter a buggy pulled by a horse just around the bend. Amish children go to their own one room school house until 8th grade. They only go to school in winter when the farm is usually quiet. The school house has outside bathrooms. One for boys and one for girls. Amish children work with their family to run the farm and have chores starting at an early age. The elementary school has approximately 350 students from K- 6th grade. There are computers in each classroom and a cluster of them in the library. This picture (taken from space) shows the school before it was renovated. There is now a beautiful library and an additional intermediate wing. The grounds behind the school offer a habitat garden, as well as a baseball field and soccer fields which are extensively used by community baseball and soccer programs. Conestoga Elementary School is part of the Penn Manor School District.